Summary: Stranger Things was the breakout hit on Netflix last year, winning multiple awards, including five Emmys. This science fiction/horror series focuses on the supernatural events surrounding a missing boy in small town, Indiana in the 1980s. Quickly renewed, Stranger Things season 2 is scheduled to be released on Netflix in October 2017. But if you don’t live in the US, you may be restricted from watching this content. We provide a complete guide to unblock and stream Stranger Things Season 2 online. We recommend Express VPN as the best in streaming quality to unblock and watch Stranger Things Online. Sign into US Netflix to watch Stranger Things Season 2 no matter your location. We have done the research and provide you with a variety of options to finding the best VPN for Netflix. The list below are our recommendations for VPN services you can use to watch Stranger Things. ExpressVPN is the best way to access Netflix content. ExpressVPN has fast, stable servers and excellent customer service. Their servers offer consistent access to Netflix streaming all around the world. You can access a 30-day free trial to test it before you commit. Sign up with ExpresVPN here. Find more information on this service on ExpressVPN review. NordVPN is another good choice for accessing Stranger Things online. NordVPN offers Netflix-optimized servers, though they aren’t consistently reliable for accessing Netflix’s services. If you’re having trouble streaming Netflix content, you can contact their customer support centers for help. You can now benefit from a free 30 day trial with NordVPN before you decide to commit to any contract. Find more information on this service on NordVPN review. PrivateVPN offers customers a regularly-updated list of servers that are able to bypass Netflix’s content restrictions. PrivateVPN also offers consistently high speeds, which means your video will stream in high-definition. Like our top 2 recommended VPNs to access Stranger Things 2, you can benefit from a free 30-day trial, money back guaranteed before you decide if you want to sign a contract. Sign up with PrivateVPN here. CyberghostVPN and PureVPN are other popular VPN services. While they offer many excellent features, neither has documented success with unblocking Netflix’s Stranger Things Season 2. 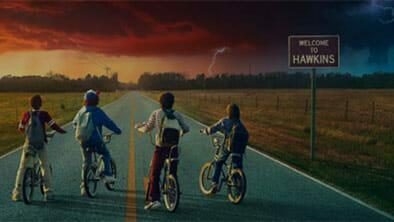 Stranger Things season 2 will be released on Netflix October 27, 2017. Set your Netflix reminders for when Stranger Things returns to the small screen in a few short months. And if you haven’t yet, binge Stranger Things Season 1, still available on Netflix. If you are traveling or reside in a country where Netflix isn’t available, use a VPN to watch this critically acclaimed series.